Coyotes, they are here to stay in Pinellas County. Dog & Cat "Leash Law"
• Please note: Pinellas County Animal Services does not trap or remove coyotes or other wildlife. Coyote reporting is for informational purposes only. Pinellas County Animal Services gathers this data for confirmation of coyote locations. A private commercial wildlife removal service should be contacted for the removal of individual offending animals. •	Coyotes are highly adaptable animals that came to Florida in the 1970s and will continue to make their homes in suitable habitats in the county. •	Scientific Name – Canis latrans, which means "barking dog"
•	Full-grown coyotes typically weigh between 24 – 37 pounds. •	Coat colors range from gray to rusty brown. •	Their bushy tails are usually black-tipped. •	Omnivores, coyotes eat just about anything. Wild fruits, insects, birds and other small mammals are some of their favorite foods, but some coyotes may prey on cats, small dogs and livestock. Garbage and pet food left outside may also attract coyotes. 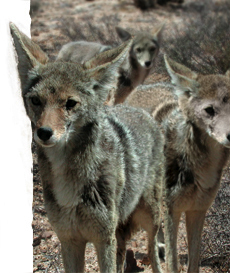 •There have been very few reported cases of western coyotes biting people. Their innate fear of humans tends to keep them from coming into close contact with people. •	The long-term solution requires public education and changes in residents’ behavior.